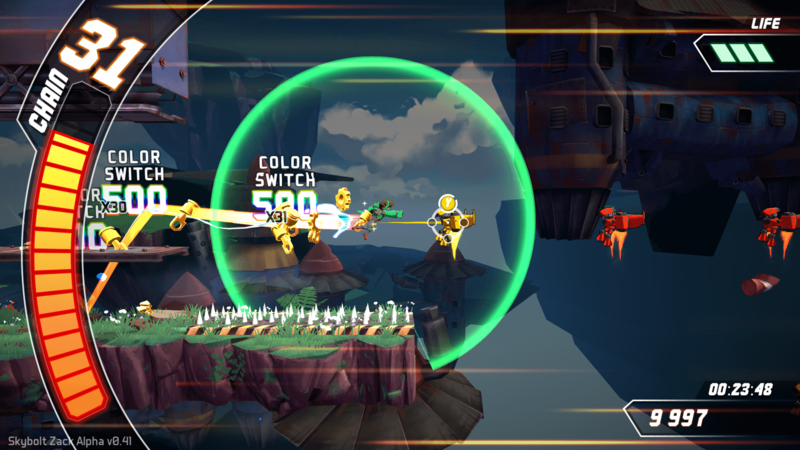 Quickly slash your way through colored robots, bullets and large doors as the mechanized protagonist, Skybolt Zack, in this lovely, fast-paced arcade platformer! Skybolt Zack sees you trying to follow the quick rhythm of the music as you rocket punch various enemies and destroy anything in your path. It’s a pretty fun game to play — you can smash through various robots by pushing the button on your controller that matches the color of what you want to destroy. Your rocket punch will take it out, although some bigger machines take a few more punches. If you play your cards right, and are quick enough with your clicks, you can go through the entire game without even touching the ground! There is a bubble around you that shows how far you can punch — as long as you have an enemy in that area, you can punch it and continue moving forward. There is something really fun about smashing through each robot, one by one, without thinking twice or touching the ground. If you do need to move around, you can walk and jump, but it is not nearly as fun. Once you start to get very good at the game, following the rhythm, busting doors, and getting into the character of Skybolt Zack, you will unlock more challenging levels! 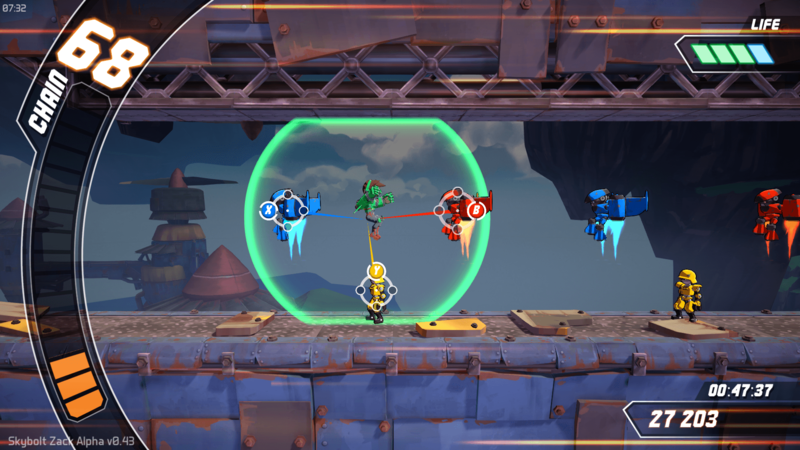 When it comes to the current levels, you can move towards the sky, chaining combos with robots that are higher on the screen. Staying up in the air also keeps you off the ground, so more points are to be won there. I was able to take on Skybolt Zack at Develop:Brighton and at the Big Indie Pitch earlier this year, but you can try the prototype for free, yourself, on itch.io.